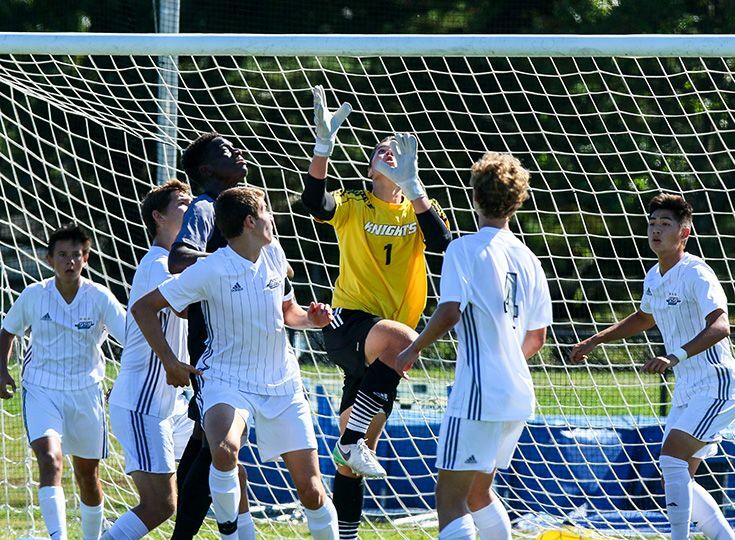 Varsity boys' soccer advanced to the semifinal round of the Prep B Championship with a decisive 8-3 win over Wardlaw Hartridge at home yesterday. The Knights took an early lead, scoring in the first minute of play and posting five goals prior to the half. Contributions came from throughout the roster, with senior Bailey Gano and juniors Andrew Moglianesi and Tyler Merna each scoring twice. Seniors August Boland and Alex Roch both posted a goal as well. Junior Dan Shen pitched in with three assists and individual assists came from Jordan Canica '21, Gano, Drew Kramer '20, Moglianesi and Gabe Myler '19. On goal, Mitch Fishbein '19 made six saves and Roch, three. The third-seeded Knights will face second-seeded Princeton Day School on Thursday. The game begins at 3:45 at Princeton Day School.